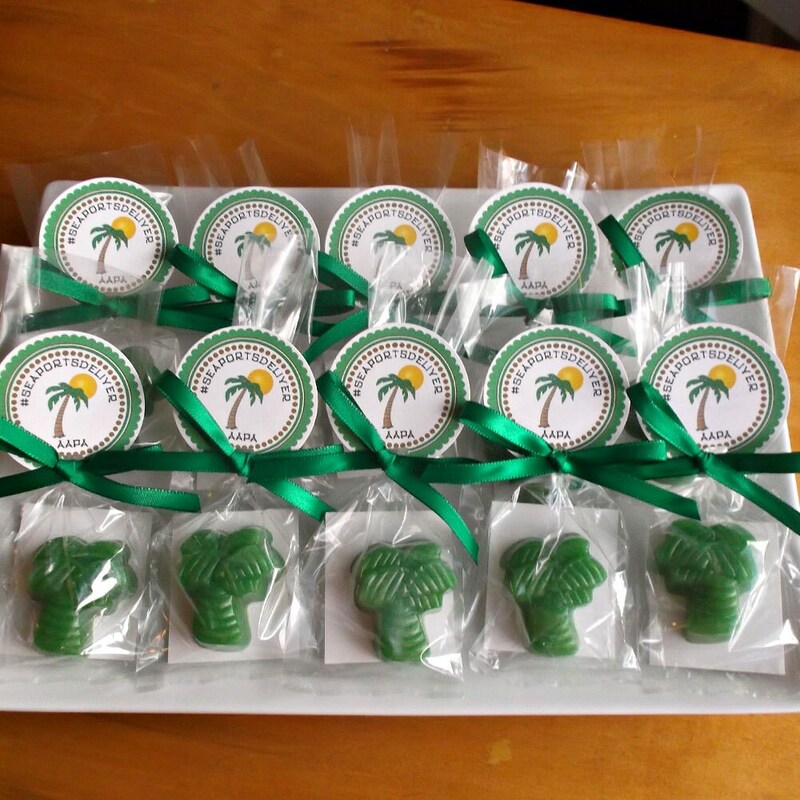 Palm tree party favors are perfect as beach party favors, Florida party favors, beach wedding favors, or Hawaiian luau party favors. Palm tree party favors are unique, will add to your decor, and are sure to be a hit at your party. Includes favor tags. Set of 10. Green palm tree soaps. Palm tree soap weighs approximately .9oz (.45 oz each). Packaged in a cellophane bag with a ribbon, "DO NOT EAT" tag and favor tag. 1) Message for your tags. Choose a tag from the 5th picture. 2) Your party date to be sure they arrive in plenty of time for your event. Berries & Cream - Strawberry and raspberry with rich cream. Birthday Cake - Rich, creamy vanilla and cake. Cucumber Melon - A fresh blend of melon and cucumber. Energy - Grapefruit, lemon, lime, cucumber, jasmine, pineapple, blackberry, champagne. Fruit Smoothie - Melons, pineapple, acai berry, nectarine, guava, pomegranate, grapefruit. Lavender - Clean, fresh, and calming. The true aroma of lavender! Lemon Ice - Zesty sugared lemon. Vanilla - A sweet, rich vanilla. These were the perfect favors for my daughter's duckie themed baby shower. They smelled great and were absolutely so cute! Personalized gift tag gave this favor that extra flair. Thanks so much the shower was a success!